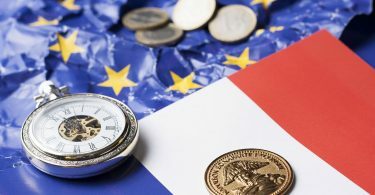 A senior private sector economist examines the reduction in trade costs due to tariff and non-tariff barriers over time and concludes that EU membership has had a limited impact. The general reduction in global tariffs and in transport costs has reduced the cost of trade. The benefits of the EU Single Market on trade are judged to be quite modest.The full report is on our REPORTS page. That EU membership has caused limited or even zero trade diversion, i.e. deflection of UK trade from other possible trade partners to the EU. The questionable nature of some of the results generated by gravity models has been shown by Gudgin and Coutts (2017), who suggest that estimates of trade creation due to EU membership have been greatly exaggerated. 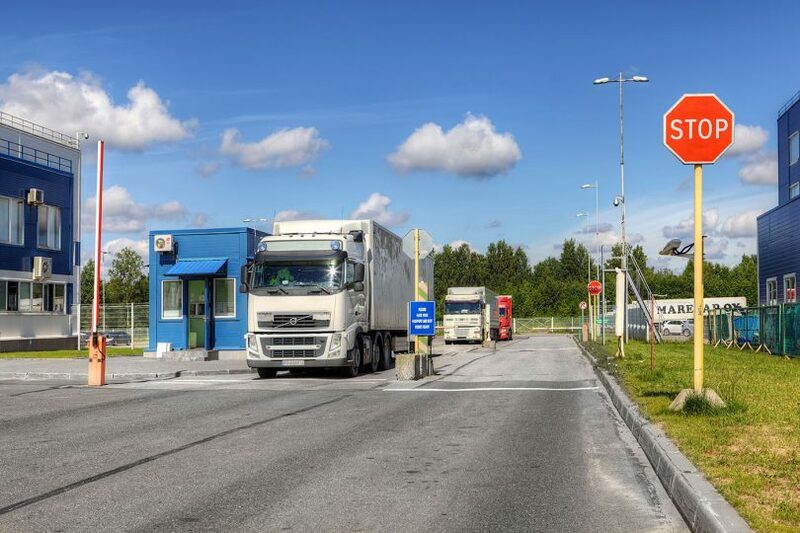 In this article, we also cast doubt on some of the key claims of the gravity model literature using estimates of bilateral trade barriers generated using trade and output data, following the approach of Novy (2011) and Springford (2017). This approach attempts to estimate all bilateral trade costs, including tariff and non-tariff barriers and ‘natural’ costs related to geography and language and cultural barriers, between pairs of countries. The approach infers these costs from trade and output data in the pairs of countries and expresses the result as an ad valorem tariff equivalent. In other words, the measure used is the estimated additional average cost of buying a good or service from abroad relative to its cost from a domestic producer. For instance, the cost of buying goods from the EU6 is currently around 40% higher than for buying domestic goods. Trade barriers between the UK and the EU-6 fell sharply in the 1970s and 1980s (see chart 1). This makes sense in the context of the removal of what were initially quite high tariff barriers between the UK and EU-6 (around 8-11% on average). But not all of this decline can be ascribed to EU membership and some of it would have occurred even if the UK had not joined the EU. World average tariffs fell from around 14% to 4% from 1970-1992 and ‘natural’ trade barriers also came down as containerisation cut transport costs and advances in information technology slashed communication costs. Notably, our estimates show that trade barriers between the UK and US over the same period also showed a significant fall. This suggests that the benefits of the EU Single Market programme, which began in 1992, have been quite modest for the UK. 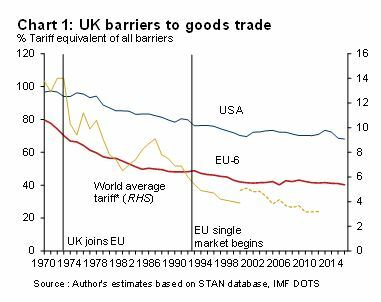 Indeed, with UK-US trade barriers also falling since 1992, it is hard to pick up much effect at all beyond what might be a general ‘globalisation’ effect (more speculatively, the channel tunnel opening in 1995 may also have had some impact). The modest estimated impact of the single market for the UK is supported by other evidence. Peterson and Boehmer (2013) found the single market raised UK output per head by just 1%. 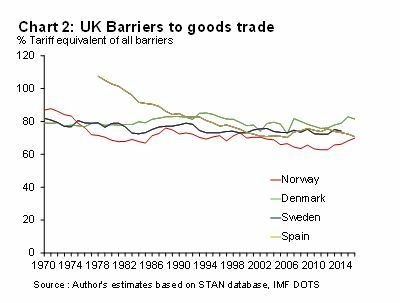 Our estimates for trade barriers over time between the UK and its former partners in the EFTA trade agreement, Denmark, Norway and Sweden, also support this view. We find very shallow or even no declines in trade barriers between the UK and these countries since the 1990s – and in some cases little change since the 1970s (see Chart 2). Trade barriers in services between the UK and the EU-6 are much higher than for goods and have declined only modestly since the early 1990s. Our result here is similar to that in Springford (2017) but covers a longer time period. 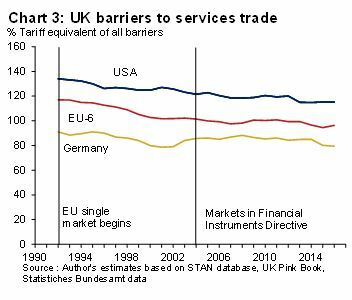 Looking just at bilateral services trade between the UK and Germany, services trade barriers appear to have barely changed since the early 1990s. Remarkably, since the early 2000s, services trade barriers between the UK and the US have fallen slightly faster than those between the UK and the EU-6 (see chart 3). Our results suggest the EU single market in services has been relatively ineffective in boosting services trade flows between the UK and the EU-6. This is in line with other evidence e.g. Ilzkovitz (2007), Badinger (2007) and Dettmer (2017), all of whom suggest weak EU trade integration in services, and Walsh (2008) whose gravity model analysis found EU membership had no significant impact on services trade (in his preferred model specification). Importantly, our results also suggest the impact of financial ‘passporting’ for the UK may be greatly exaggerated. 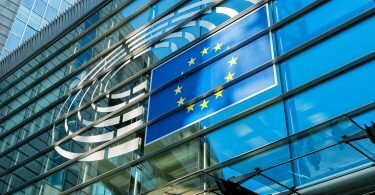 ‘Passporting’ developed from 2004 onwards when the Markets in Financial Services Directive was introduced, aiming to ease EU financial institutions’ ability to sell products across borders. But since 2004 we find almost no decline in services trade barriers between the UK and EU-6, even though financial services form a large share of UK services exports. Trade barriers between the NAFTA countries have also fallen considerably since the 1970s – and their level is similar to those between the UK and the EU-6 (see chart 4). This is a striking finding as NAFTA is a somewhat looser trade arrangement than the EU, not featuring either a customs union or single market and having traditional customs borders and rules of origin checks on goods. Joining the EU led to a very big rise in trade barriers between the UK and former Commonwealth trade partners. In 1970, we estimate that the level of trade barriers between the UK and Australia and Canada was similar to that between the UK and the EU-6. 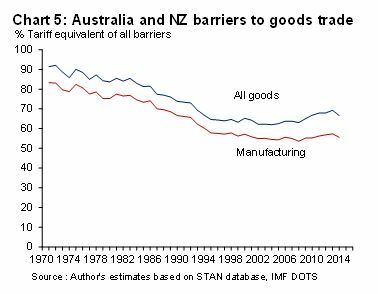 But by the mid-1980s, trade barriers had risen by the equivalent of around a 20% tariff (see chart 5). This rise is especially striking given the general decline in international trade barriers in this period. It would be remarkable if the rise in trade barriers in the 1970s and 1980s had not had very large trade diversion effects (in contrast to the claims of the gravity model literature). Overall our results suggest that differences between EU membership, single market membership (i.e. through the EEA arrangement), and free trade deals may be somewhat smaller than much of the Brexit-related literature suggests. The effects of the EU single market (which, importantly, also led to the abolition of routine customs checks within the EU) on goods trade barriers between the UK and EU-6 seem to have been relatively modest and hard to disentangle from globalisation effects. For services trade, the effects appear to have been smaller still. So, while much attention in the UK currently focuses on the need for a future trade arrangement with the EU that has a significant services component, our analysis suggests this focus may be misplaced. 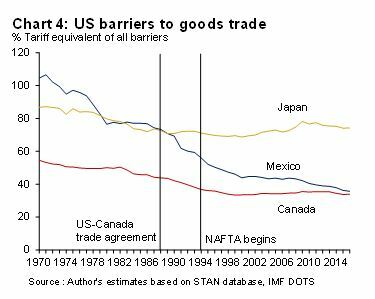 Meanwhile, our estimates of trade barriers between the NAFTA states suggests that this trade agreement, much looser than the EU system, has apparently reduced trade barriers to a similar level to those between the EU-6 and the UK. We also find that EU membership greatly increased trade barriers between the UK and former Commonwealth trade partners. So free trade agreements may be able to deliver much of what the UK might want from a future economic relationship with the EU, as well as increasing trade with non-EU partners.